Encouraging and fostering the ideal of service. The development of acquaintances and friendships is an opportunity for service. 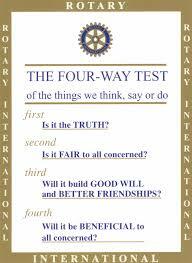 Living by the 4-way test with integrity and good character. The recognition of the worthiness and respect we have for all people and their occupation or profession. The "glue" or "fabric" of Rotary is service above self in personal, business and community life. Service is rewarding and stimulates fellowship, goodwill and peace through the world. Goodwill begins with understanding and respect. We are all different, but can unite to do good around the world. Tolerance and acceptance of our differences is central to the object of rotary.